Tricky corners, sippy spouts, slim straws…sippy cups are essential for teaching your toddler to drink like a big kid, but sometimes you can't get them as clean as you'd like. 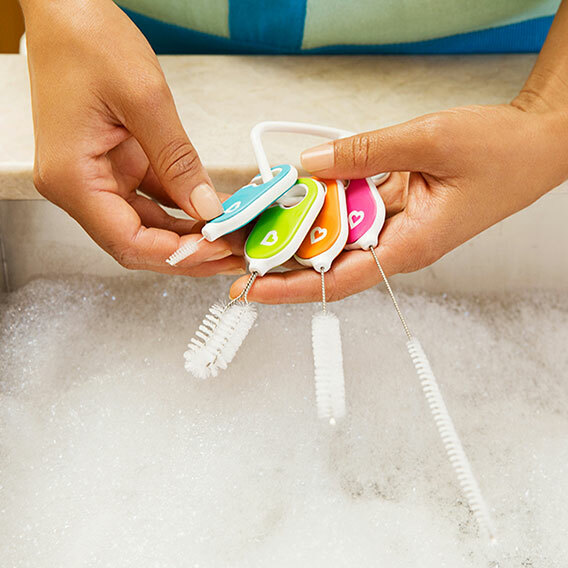 Munchkin's convenient brush set, Details™, solves all of your cleaning issues! Equipped with four uniquely-sized brushes, it will clean and scrub every crevice no matter how tiny. The Details™ brush set includes a straw brush, spout brush, lid and threads brush, and detail brush. An added bonus, there is a pick on the storage ring that makes it easy to remove sealing rings. No more residue or wondering how clean your cup really is!